OSWEGO, NY – Paddlers of all ages and abilities made their way through the the locks on the Oswego River Canal Saturday. Once they arrived in the Port City, they celebrated the second annual “Rock the Locks” paddlefest. 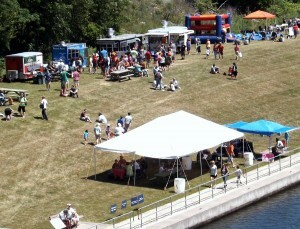 “The event encourages kayakers and canoeists to enjoy and appreciate the unique beauty of the historic Oswego River, followed by good food and music along the canal in Oswego,” according to Jake Mulcahey, Paddlefest chairman. Paddlers could choose to do the full 10.3-mile course from Fulton to Oswego or the shorter 4.2-mile course from Minetto to Oswego, Mulcahey noted. At one time, there was an estimated 250 plus kayakers and canoeists taking part in the paddle. A youngster reclines on some large blocks at the Children’s Museum’s area at the fest. Paddlefest is designed to be a fun, community event. A portion of the money raised was donated to the Oswego City-County Youth Bureau for activities that support youth and families in Oswego County. They will use some of the money to support the annual holiday tree lighting ceremony in the city of Oswego. 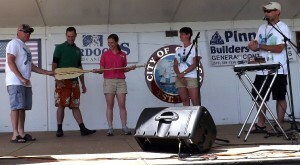 Dawn Metott of the Youth Bureau accepted the paddle this year and ceremoniously passed it along to Jon and Jillian Shaver as the Children’s Museum of Oswego will benefit from the 2015 Paddlefest. 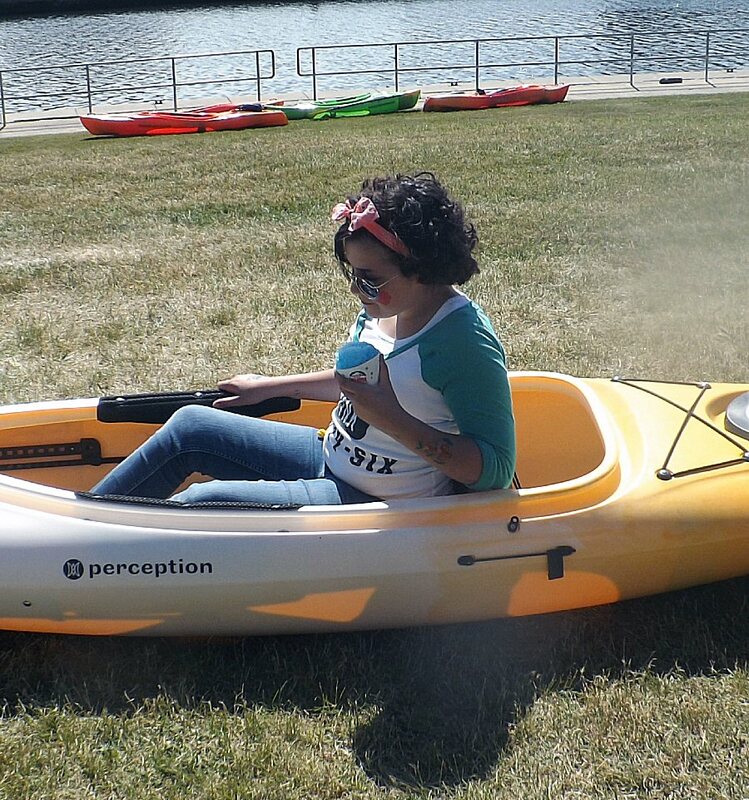 A young lady checks out the kayak that was raffled off. Following the paddle, “Rock the Locks” got under way at noon at the Lock 7 park with music by popular local talents Dos Locos and John McConnell. 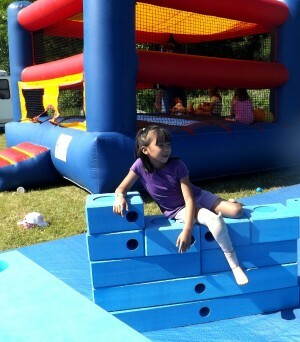 A variety of food vendors provided children’s games and other activities throughout the afternoon. 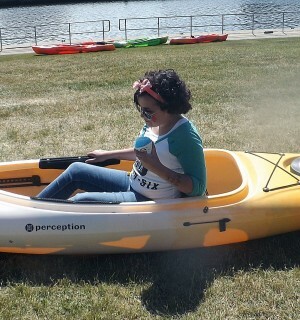 Paddlers and spectators had a chance to win a new Perception Prodigy 12 kayak valued at $800. The kayak package, with a paddle and personal flotation device, was donated by Benjamin Turner of Murdock Bicycles and Sports. The winner was Dawn Metott. Rock the Locks Paddlefest 2014 was sponsored by Pinnacle Builders USA Inc., River Run Kayaks, Cre8 Studios, Murdock’s Bicycles and Sports, the Beacon Hotel, Chase Enterprises, the Fitzgibbons Agency, the Oswego County Sunset Group, with support from the American Canoe Association, NYS Canal Corporation, ARC of Oswego County, Minetto Volunteer Fire Department, U.S. Coast Guard Auxiliary, Oswego County Sheriff’s Office, Oswego County Yakkers, Oswego City-County Youth Bureau, Oswego County Emergency Management Office, La Parilla restaurant, Oswego County Federal Credit Union, Shanley Law Office, Debbie Anderson – Reflections Hair Salon, Fulton Savings Bank, Oswego Firefighters Benevolent Association, Pathfinder Bank, Babcock Highway Supply, and Oswego County Department of Community Development, Tourism and Planning. 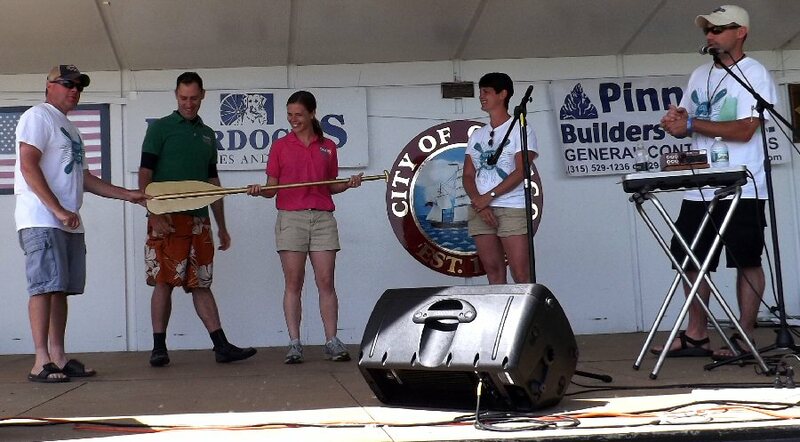 Event chairman, Jacob Mulcahey, right, announces the winner of the Golden Paddle for 2014, the Youth Bureau. They passed it along to the Children’s Museum. From left are: Brian Chetney of the Youth Bureau with Jon and Jillian Shaver of the Children’s Museum and Dawn Metott of the Youth Bureau.